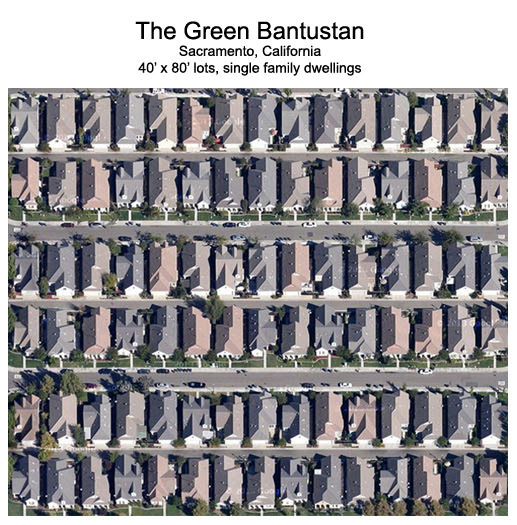 The war on the detached, single family home, and — more to the point — the war on residential neighborhoods comprised exclusively of single family homes, is on. And it’s gone national. First there was the war on the back yard. Large lots became crimes against the planet — and if you doubt the success of this war, just get a window seat the next time you fly into any major American city. In the suburbs you will see a beautiful expanse of green, spacious, shady neighborhoods with lots designed to accommodate children playing, maybe a pool or vegetable garden, big enough for the dog. 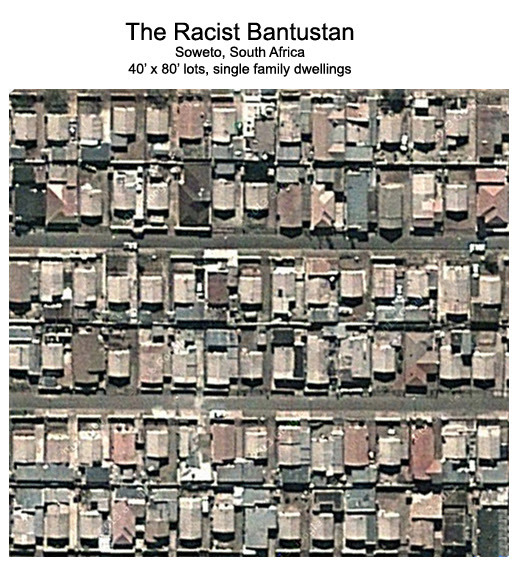 The image below shows homes packed roughly 15 per acre — including the streets — on private lots that are 40-feet wide by 80-feet deep. As of January, these homes were selling for $350,000. Such a deal! Smart growth! We live in the most expensive state in America, and it is completely the result of political choices made by the California legislature. Across all sectors – oil, gas, electricity, water and housing – environmentalist arguments prevail. But there is a hidden agenda that most sincere environmentalists still don’t recognize. An agenda that pursues profit and power, instead of practical environmentalism that balances the interests of the planet with the interests of the people. Even Gov. Brown has refused to support a ban on fracking in California. Moreover, there are reserves of oil and gas in California that don’t require fracking. Using slant drilling, for example (a technology that didn’t exist back in the 1970’s when offshore oil drilling was banned), you can access natural gas reserves in the Santa Barbara Channel from land based rigs. But fossil fuel development is only one issue that ought to be up for debate. What about nuclear power? The technology has come a long way in the last fifty years. Even if coastal reactors are considered too dangerous, why not build some in geologically stable areas inland? There’s plenty of land in the Mojave Desert where nuclear power plants could be sited. And what about desalination? It’s only too costly if you consider California prices – artificially inflated – they build desalination plants in Israel for one quarter the price per output. Why can’t we? What about water storage – what about the proposed Sites and Temperance Flats reservoirs? What about sewage reuse? Californians produce about 3 million acre feet of sewage each year, much of which is cleaned and poured into the ocean, when if we cleaned it a bit more we could reuse it. What about housing? California’s a supposed sanctuary state, inviting millions of people in. Where are they going to live? Why do you think, even in the inland valleys, homes are priced at $400,000 or more (usually much more)? Do you actually think homes need to cost this much? All of this is contrived, artificial, politically created scarcity. 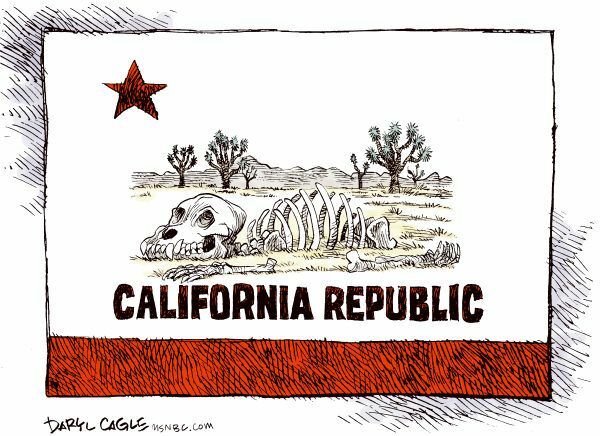 And it is making a lot of people filthy rich, while it makes life very difficult for 90%+ of California’s residents – old and young, regardless of ethnicity or immigration status. Environmentalists in California act like they have all the answers. They are arrogant and selective in the facts they use. What about all the embodied energy in wind and solar installations? Do we ever hear about the payback periods for all the energy it took to build that stuff? What about the impact when taking into account the need for natural gas peaking plants that have to spin into action every time the sun goes behind a cloud or the wind dies down? What about the difficulty in storing intermittent energy, or the fact that sourcing rare earth metals for electric car batteries is causing environmental havoc all over the planet? One might assume that of someone holds these positions they must not care about the environment, but if so they’d be wrong. We need an honest discussion about these issues, without ceding the discussion to environmentalist trial lawyers, phony “green” entrepreneurs, and oligarchs who control the artificially scarce supplies of entitled land, housing, electricity, gas, and water. Because they just want to keep things the way they are so they can continue to make money. There’s two sides to this story. Efforts by Democratic lawmakers to overhaul two state environmental boards they viewed as too tight with developers and the oil industry foundered badly on the final day of the legislative session. Three bills to increase transparency at the California Coastal Commission and increase state appointments to a Southern California air pollution regulator fell far short of passage in the Senate and Assembly after business and labor groups stepped up pressure on legislators. The loss was particularly stinging for members who have led a vocal campaign this year against perceived problems at the coastal commission. Sen. Hannah-Beth Jackson, D-Santa Barbara, said she would take up the fight again next session. Twin legal settlements with environmentalist plaintiffs put a freeze on fracking in California waters. “The agreements in Los Angeles federal court apply to operations off Ventura and Santa Barbara counties, where companies such as Exxon Mobil Corp. operate platforms,” the Wall Street Journal reported. “Federal agencies will have to complete the review by the end of May and determine if a more in-depth analysis is necessary,” the paper added. “They will also have to make future permit applications publicly accessible.” If the practice clears federal scrutiny and is deemed adequately safe to the environment, fracking operations could continue. If not, they could be postponed or forestalled indefinitely. The result marked a significant win for the Center for Biological Diversity and the Environmental Defense Center, two organizations that alleged frackers had imperiled aquatic life with “over 9 billion gallons of wastewater” each year, according to Grist. Accusing the U.S. Department of the Interior of “rubber-stamping fracking off California’s coast without engaging the public or analyzing fracking’s threats to ocean ecosystems, coastal communities and marine life,” as the Christian Science Monitor observed, the groups filed suit against the federal government. For their part, defendants insisted the case was without merit. “Catherine Reheis-Boyd, president of the Western States Petroleum Association, said that the petroleum industry has operated safely in California for decades, working closely with regulators and other officials,” Natural Gas Intelligence reported. Industry defenders have argued that offshore fracking levels in the Pacific haven’t been that high. While the moratorium “will not likely affect production at large because California has not been producing much offshore oil lately,” Reuters noted, “companies have fracked at least 200 wells in Long Beach, Seal Beach, Huntington Beach and in the wildlife-rich Santa Barbara Channel,” according to the Center for Biological Diversity. The American Petroleum Institute, which joined the suit as a defendant, has refused to agree to the settlement package. Other hurdles to its implementation have arisen. The two separate settlements must still be approved by a federal judge, according to NGI. Although the EPA largely exonerated fracking of the dire accusations leveled against it by some environmental activists, the practice has re-entered the public debate in California due to the massive gas leak in the Porter Ranch neighborhood of greater Los Angeles. Maya Golden-Krasner, an attorney for the Center for Biological Diversity, recently linked the disaster to fracking in an editorial at the Sacramento Bee; “newly uncovered documents show that hydraulic fracturing was commonly used in the Aliso Canyon gas storage wells,” she wrote, “including a well less than a half-mile from the leak.” Perhaps predictably, Golden-Krasner called for Gov. Jerry Brown to ban the practice of fracking across the state of California. Any discussion of California’s neglected infrastructure has to recognize the three factors most responsible: Libertarians, environmentalists and government unions. Picking libertarians as the first example is not by accident, because libertarians are perhaps the most unwitting participants in the squelching of public infrastructure investment. By resisting government involvement in any massive public works project, libertarians provide cover to public sector unions who know that public works funding competes for tax revenues with their own pay and benefits. When it comes to squelching public infrastructure investment, however, nobody can compete with California’s environmentalist lobby. Their lawsuits have stalled infrastructure development for decades. And the identity of interests between government unions and environmentalists is multi-faceted. The most obvious is that when there is no money for infrastructure there is more money for government worker pay and benefits. And of course, the more environmentalist regulations are passed, the more need to hire more unionized government workers. Then there are the unintended and largely unnoticed financial consequences of environmentalism abetting the government union agenda. As California’s carbon emission auction collections slowly grow into billions per year, government jobs are redefined to incorporate “climate change mitigation.” Code inspectors and planning department personnel become climate change enforcers ala revised building codes and zoning laws. Bus drivers become mass transit workers mitigating climate change. Firefighters combat lengthier fire seasons, and even police are called into action because hotter weather is correlated to higher crime rates. And as they work to mitigate the impact of climate change, all of them quietly qualify for a share of the carbon emission auction proceeds. The unintended economic consequences of environmentalism abetting the government union agenda are among the hardest to explain. Of course environmentalism can slow down economic growth. At some reasonable level – which we’re well beyond – that’s even desirable. But the environmentalist squelching of public infrastructure development, along with competitive private sector development of land, energy and water resources, has created artificial scarcity. In turn, this drives up asset values which helps government pension funds two ways (1) directly through appreciation of their invested assets, and (2) indirectly, by creating new real estate collateral for consumer borrowing which stimulates consumer spending which creates corporate profits and stock appreciation. In short, the economic consequences of artificial scarcity are asset bubbles that, for a time, keep unionized government worker pension funds solvent. When you can’t afford to own a modest home, or run an energy intensive business, remember this. What libertarians and environmentalists both need to understand is that massive public works are one of the prerequisites for broadly distributed prosperity. And the environmentalist bias against massive civil engineering projects is two-faced. For example, managing delta salinity, the flow of the San Joaquin River, and the very existence of one of the largest refuges for waterfowl in the American southwest, the Salton Sea, are all dependent on dams, aqueducts and irrigation. But no more? If you search for interest groups that favor massive civil engineering projects, you’ll look far and wide and find nothing of significance. Private sector unions ought to be leading the charge, but in recognition of the power of environmentalists and government unions, they settle for politically correct projects of marginal productive value – high speed rail, delta tunnels, and the occasional stadium. The Silicon Valley lobby is even worse – rather than support abundance through innovation, they embrace conservation through surveillance. If Californians recovered an additional 10 million acre feet per year of fresh water through civil engineering projects such as desalination, dam storage, and sewage reuse, there would be no need to embed internet devices into “smart” (and mandatory) side loading washers, low flow toilets, water meters, dish washers, and irrigation systems. The biggest challenge ideologically however confronts libertarians. Because in the real world, we need to build civil infrastructure within a financial and legal framework that relies to some significant degree on government. If libertarians can reconcile their ideals with the needs of Californians, they might rally private sector union leadership, practical environmentalists, and altruistic members of the public sector. 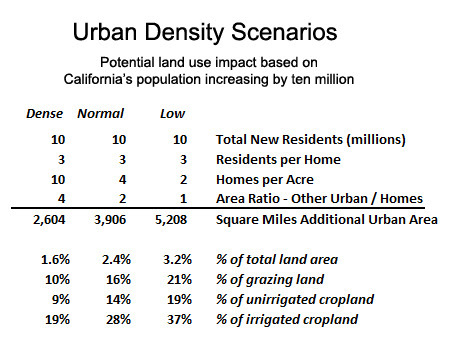 Massive infrastructure development in California on all fronts is long overdue. The revenue producing elements of this infrastructure could be financed through the pension funds – only consuming a fraction of their assets – and give truth to their currently preposterous assertion that they’re helping our economy. Imagine if California’s government, with help from private and federal sources, was truly committed to creating abundance again through massive civil engineering projects across all areas of critical infrastructure. Can libertarians find a formula that would enable them to urgently support this without violating their core ideals? Can they support development while also being the watchdog against corruption? It could make all the difference in the world.